When shopping for suspension parts finding a reputable brand is important as it can ensure you receive a durable product. To accomplish this, comparison shop as this can help you see what each brand offers as well as where to find the best prices on your part. When you research you will see one of the best brands to go with is Moog. Pros: Moog suspension parts are designed for durability. They do this through their innovative design, which seeks to solve OE problems while providing drivers with products that are easy to install and are long lasting. Some of the Moog suspension parts include Moog coil springs. They make two types of springs, one that is constant rate that helps keep handling in its original state and variable rate springs, which are design to help vehicles carry heavy items. Along with this they have many other parts that include Pitman Arms and Moog chassis parts. What separates Moog suspension parts from the rest of the pack is their construction, which helps products last for the long haul. They accomplish this by using powdered-metal-gusher-bearings that will reduce wear on the components. Further, as the design allows grease to flow through the bearing it will help extend the life of the parts. Cons: Meanwhile, I didn’t come across any drawbacks when reviewing Moog suspension parts. Instead, drivers remark how well they like this equipment over other brands. This shows Moog’s attention to detail and quality construction as these components are well worth the investment. 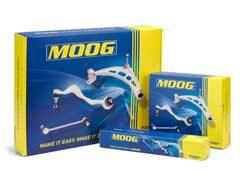 Ultimately, if you are in the market for suspension parts give Moog a look. Their equipment is designed for the long haul and drivers love the performance these parts deliver. When you stack them up against competing brands, you will find their performance and longevity help them hold their own against other top manufacturers. If you want to buy some, you can go to local auto parts stores like Advance Auto Parts. You can also visit online retailers like Amazon as they have many auto parts available from suspension lift kits to shocks and struts. Furthermore, with a huge inventory you can find what you need at lower prices.